The Uvasagaharam Stotra is composed by Acharya Bhadrabahu (433-357 B.C. 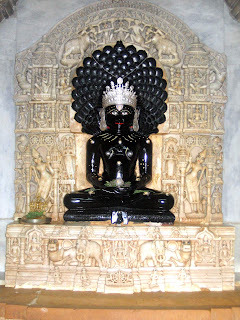 ), is dedicated to Lord Parshva, the 23rd Tirthankar. Acharya Bhadrabahu had a brother named Varahmihir. Both were in the same kingdom. When a son was born to the king, Varahmihira declared that he would live for a hundred years but Bhadrabahu declared that he would live for only seven days, and that he would be killed by a cat. On the eighth day the prince died because of a door's anklet falling on his head which had a picture of cat drawn on it. Due to this humiliation Varahmihira left the kingdom and died after some time. According to the story Varahmihira became evil and tortured and terrorized the Jains, especially disciples and followers of Bhadrabahu. 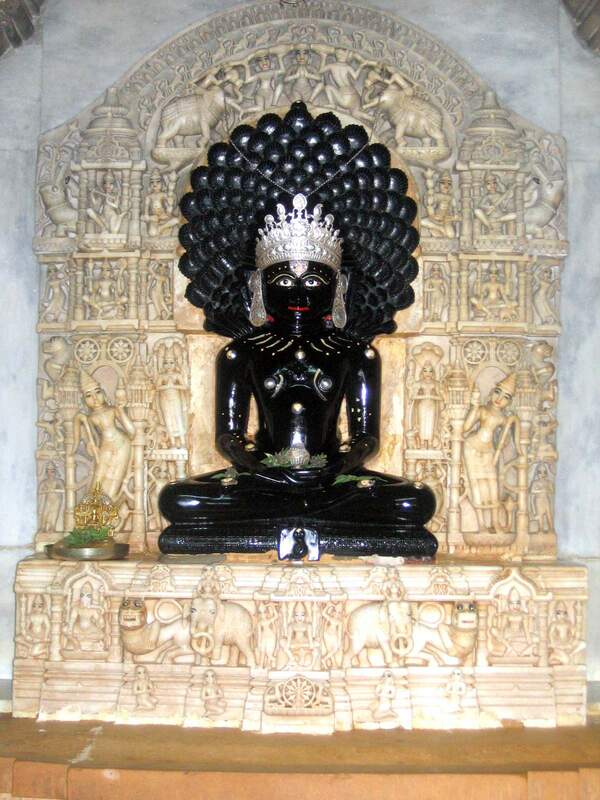 Acharya Bhadrabahu then formed a mantric prayer to 23rd Jain Tirthankara Parshvanath called the Upsarga stotra (now known as Uvassagaharam Stotra) and called upon Dharnendra, the divine follower (a "devta") of Parshvanath. As an effect of it, Varahmihira was defeated and Jain society was relieved. That mantric prayer is still famous among the Jains and they chant it with due respect and faith. And that prayer had made Bhadrabahu's name immortal among Jain ascetics. BHAVE' BHAVE PASA ! JINACHANDA. I bow to Lord Parshwanath, who is served by the demi god. Parshwa, who is the remover of all afflictions, free from all sorts of Karmas, the destroyer ofthe poison of the poisonous animals, and is the abode of bliss and well-being. Aside from that charm, even bowing to you would be highly fruitful (resulting in divine life etc. ); all beings would not (thereby) be in an unhappy or a miserable state. If one gains the truth presented by you, which is superior even to thedesire yielding tree, the soul can gain age-less and immortal state withoutany obstacles. Great graceful Lord, I have adored you this way with devoted heart, therefore Lord Parshwanath, kindly bless me with the true knowledge in every(remaining) birth. The meaning of "VISAHARA PHULLINGA MANTAM. KANTHE DHARE'I JO SAYA MANUO";TASSA GAHA ROGA MARI, DUTTHA JARA JANTI UVASAMAM; what you say is wrong. its not wearing a snake charmer around your neck. It means to say that a man(manuo) who can recite this mantra by-hearted will get healed from all vish(poison) of life.All his problems will be solved by reciting this mantra daily.